The Grinch and Max are ready to roll! Statue inspired by How the Grinch Stole Christmas! Features amazing detail, vivid color, and Jim Shore's special touch. Measures about 9 1/10-inches tall x 7 1/2-inches long. Here's an incredible holiday decoration inspired by How the Grinch Stole Christmas! 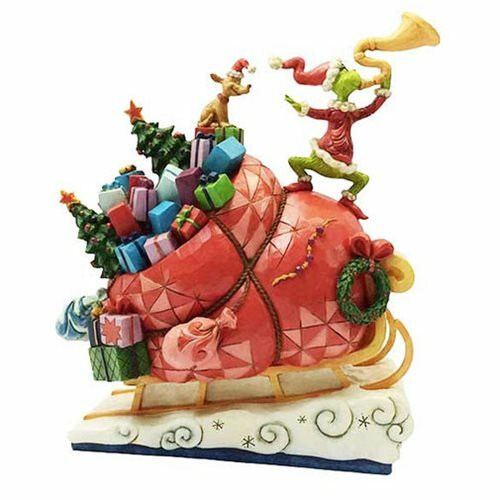 Featuring amazing detail, vivid color, and artist Jim Shore's special touch, the Dr. Seuss The Grinch Grinch on Sleigh Statue by Jim Shore has Max and the Grinch blowing his horn atop a bag that's simply bursting with presents. It's crafted of stone resin and measures about 9 1/10-inches tall x 7 1/2-inches long x 4 1/2-inches wide.